The photo above, in close up, from Alexander McQueen's last show in Paris yesterday. 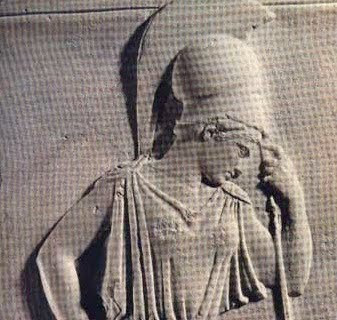 The image below, from the Acropolis Museum: Athena mourning fallen warriors. McQueen found inspiration in everything--works of art, nature's patterns, the mindless beauty of machines in action. 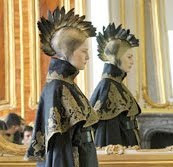 There's no saying whether or not the model's feathered headdress was inspired by the helmet of the goddess. It could have as easily come from 70s punks in London's East End. But the echoing resonance, the unanswered questions, and the poignancy, are symptomatic of the turns the mind takes in the presence of high art. I'm certain that throughout this last collection, the phenomenon occurs again and again.